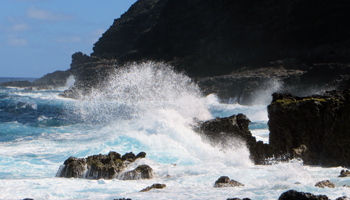 Makapuu Lighthouse Trail: a scenic Hawaii stroll or an Awesome Hawaii adventure. A Scenic Stroll or an Awesome Hawaii Adventure! 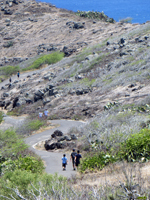 NOTE: In February 2015 and July 2015, the Makapuu Lighthouse trail will undergo maintenance and improvement construction. Therfore, the trail will be closed off-and-on during these months (see schedule, link opens a new tab/window). There is no official word as to whether they'll be following the traditional Hawaiian construction schedule (dragging it out until a year or more past the target completion date); so before you go, check the official schedule I linked above. I have hiked the actual Makapuu Lighthouse trail exactly twice (to take the pictures for this page). Yet I have been to the top (and bottom) of the hill on which the lighthouse sits at least 15 times. This is one of my favorite Hawaii hikes; and the surrounding area has been a great place for me to discover adventure activities in Hawaii! 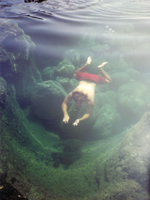 In short, it has been one of my favorite Hawaii things to do throughout the years. I proposed to my wife at this location; and I almost wish we could have gotten married there! As a result of its scenic location, the Makapuu Lighthouse trail offers fantastic views of Oahu’s east and south shores, including Koko Crater, Pele's Chair, Makapuu Beach, Sea Life Park, Rabbit Island seabird sanctuary, Turtle Rock, and, of course, the lighthouse for which the trail is named. 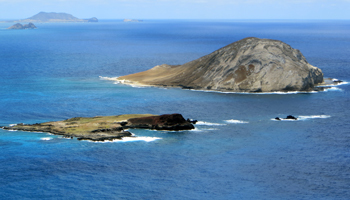 On a clear day, it’s also possible to see the islands of Molokai, Lanai, and Maui! And if you’re there between approximately December and May (January to March is best), keep your eyes open for migrating humpback whales. I had multiple sightings of of about 25 different whales from this location at the end of March. 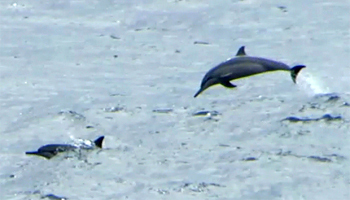 And I also saw a pod of 25 or more dolphins go racing past while I was whale watching. Finally, this location is popular for hang gliding, which gives you one more Hawaii sight to see while you’re there. The actual Makapuu Lighthouse trailhead is located a short way downhill from the Makapuu Lookout (on the western slope); and the parking is usually adequate if you arrive before mid-day. One of two Kaiwi Scenic Shoreline trails, the lighthouse trail (or Makapuu Point trail) is a 1.5-mile (round-trip) paved access road that gradually climbs 450 feet to the ruins of the old lighthouse keeper residences on the eastern tip of Oahu. 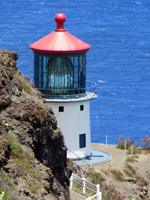 The Makapuu Lighthouse itself is of unique historical significance. Look for it directly below the cliff-top overlook at the end of the trail. Completed in 1908, this signal beacon was built to house a hyperradiant/hyper-radial Fresnel lens – the only one ever used in any United States lighthouse. This lens, which is still in daily use today, was one of only a couple dozen scattered throughout the entire world; and it’s among the largest ever put into use. The lighthouse was manned until 1974. It’s now automated and operated by the U.S. Coast Guard. Access to the lighthouse is restricted. For those of you old enough to remember “From Here to Eternity”, the book’s author, James Jones, was stationed at Makapuu in 1941. In addition to Makapuu Lighthouse, the very top of the hill is home to a portion of the old Oahu coastal defense system. Constructed from the early 1930’s through the middle of World War II, the complex once included defensive bunkers, machine gun pillboxes, and three fire control stations, which were used to track targets and relay firing coordinates to the batteries at Pearl Harbor, Waikiki, and Kaneohe Bay. These structures are largely in ruins today; but they’re nonetheless still interesting as a visual reminder of how WWII came to the American shores only in Hawaii. 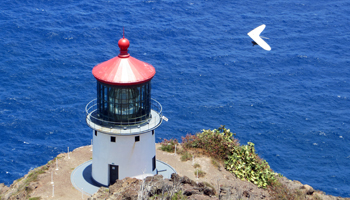 Ok… so that’s the official Makapuu Lighthouse trail. But in my opinion, the end of the trail (well, almost the end) is where the Hawaii extreme activities begin! 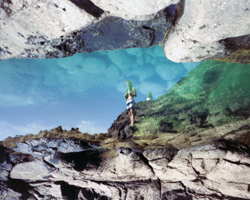 When I was in high school, I had heard that there are large tide pools at the bottom of the hill below the lighthouse. Well, I had to see this for myself, so I made my way out to the edge of the cliff and started climbing straight down the cliff-face. Honestly: I wondered the whole way down how I would ever get back up again. But rather than stupidity, we’ll call it serendipity. No, it was stupidity. Anyway, I somehow made it safely to the bottom; and after some exploring, I found what passes for a rudimentary trail up a much more manageable portion of the hillside! 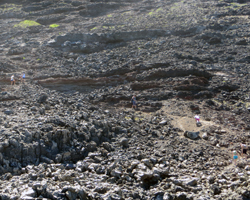 If you decide you want to explore the tide pool area down below the Makapuu Lighthouse, take the trail. Don’t climb down the cliff. There’s a huge difference between a 50-degree slope and a 75-degree slope! To find the trail going down, stay on the paved road until you come to the informational sign that says “A Sanctuary for Humpback Whales”. 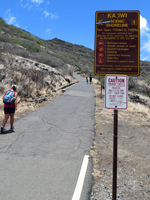 The Makapuu tide pools trail starts between the whale sign and the two hazardous conditions warning signs. Then just look for the rocks that look like they’ve been trampled more than others and/or for white arrows painted here and there on the rocks. Then be careful, because the rocks are loose and brittle. It’s easy to lose your footing on this slippery slope (but it’s still better than climbing down a cliff made out of the same crumbly stuff). 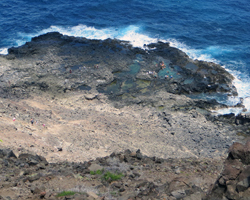 You can see some of the tide pools from the Makapuu Lighthouse trail hundreds of feet above. But when you actually get down to the bottom, the first thing you’re likely to encounter is the trident blowhole. I call it that because it shoots seawater out of three adjacent holes like the prongs of a trident. You’ll know you’re near this natural wonder when you hear air sucking through the rocks like a train rushing through a tunnel. Then just follow the sound or look for a three-pronged water spout. The trident blowhole isn’t nearly as regular as the Halona Blowhole, but I think it’s a lot more extraordinary for several reasons. Three spouts are more impressive than one. And when the wave conditions are just right, all three spouts shoot seawater up approximately 25 feet (8 meters)! It makes a lot of noise even when no water is visible. Whereas the Halona Blowhole pushes water through approximately 5 to 6 meters of rock to the spout, this triple water canon is more like 50 to 60 meters from the water’s edge! As a result it fires a lot less frequently, but it’s amazing that water shoots out of it at all! Then there’s another big hole beyond the trident blowhole. Again, when the conditions are right, seawater shoots out of this hole in a pillar 1-meter in diameter! Just be careful not to fall into this hole, because I don’t know how you’d ever get out alive. 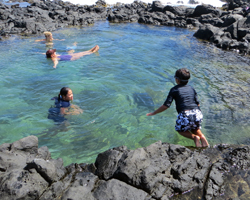 Beyond the blowholes are a couple of giant tide pools that are big enough for swimming. After a hard, hot hike, nothing is more refreshing! Just be aware that you’re getting close to the ocean’s edge and you need to exercise caution about where you stand, sit, or swim. 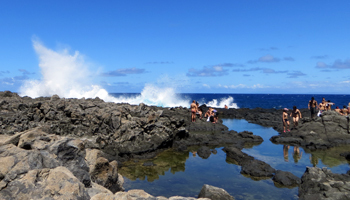 These tide pools are filled by strong surf crashing into the rocks at the water’s edge and spilling up over the top of the rocks into the pools. Though the tide pools themselves are relatively safe from the surf, the closer you get to the water’s edge, the more dangerous things become (especially if your back is turned to the waves). If you’re not careful, these waves could easily knock you off your perch into all kinds of peril! So pay attention to what’s going on around you. There are no facilities (bathrooms, water fountains, etc.) at this location. The nearest such facilities are down at Makapuu Beach. 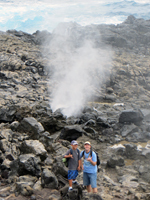 This Hawaii activity is located in one of the consistently hottest and driest parts of Oahu. Bring plenty of water and don’t push yourself beyond your limits. There is no shade anywhere. Use sunscreen and protective clothing. Do not leave any valuables visible in your car. Disclaimer: I’m not recommending that you take the unofficial trail down. I’m just telling you what’s down there in case you decide you’re up to the challenge and prepared for the risks. Be aware that your decision to leave the official trail is at your own risk. Even so, remember that stupidity and carelessness can kill you. Use your brain and take responsibility for your own safety. Know the limits of your ability and stay within them. Watch your kids like a hawk. Heed posted warning signs. Never turn your back to the waves. Take this guidance, mix it with your own good judgment, and live to enjoy the rest of your Hawaii adventure vacation! Death or serious injury is the worst way to end a Hawaii vacation; so don’t do either of those.